I’m on my way to Cali! It’s weird that this is actually happening. I still feel a little in denial… as I have been explaining to my family, just think of it as summer camp! And then once summer is over fall camp! Winter Camp! Spring Camp! My dad is a trooper. He tells me he loves to drive, so I let him the whole way. I’d guess I slept about six of the 12 hours on the road. Someone told me once that Texas is a crappy state with a bunch of nothing and only four major cities. I was offended when he said it – he’s not a native Texan, clearly – but I guess you could say that’s pretty on point because we were driving through a whoooooole lot of nothing for awhile. 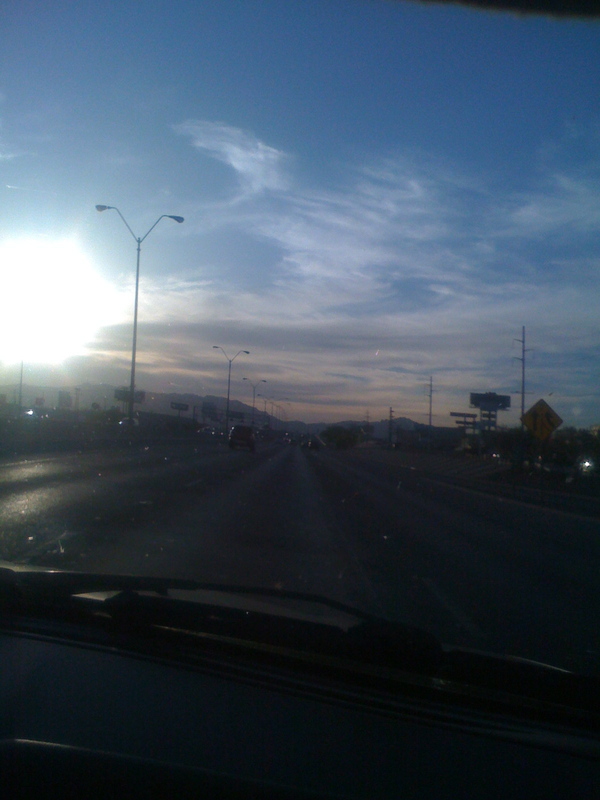 I woke up toward the end of our trip to El Paso, which was actually quite pretty with mountains in the background. It made the area seem more confined, yet at the same time very open and spread out. Not like I’d ever want to live in El Paso (it smells), but maybe somewhere with mountains someday. – At the first rest stop around Kerrville, I used the ladies room. Two little girls under the age of six where in there and one was trying to open my stall. I couldn’t help but laugh. I walked out of the bathroom and her dad was yelling back “Hold your horses, she’s coming!” And the mom was yelling “Darlin’, I’m coming! Just wait a minute!” Ohhhhh children. I don’t want any for a long time. – We saw a dust storm. Never seen one of those before! – Border Control is real extensive. We got into New Mexico around 8:00 (Mountain time) after leaving the house around 10:00 (Central time). The sun had gone down and the sky was a pinkish-purple. Very beautiful. I immediately called Stewart because he’s all about New Mexico and talking about how ghetto his childhood was (which, frankly, I think is BS – he’s given me two separate accounts about how hard-knock his life was compared to how he was one of the more fortunate ones) and let him know we got into his territory. I also immediately let him know it smelled like poop, because it did. He didn’t like that so much 🙂 By the way: babis, if you’re reading this I LOVE YOU AND MISS YOU already! Here’s the deal: I’m sharing a room with V in our two bedroom apartment. Aly (Ali? Ally? I’ll get this down soon) has her own room and V and I are sharing to cut expenses while I’m getting on my feet. Works out great except I’m not exactly “legal” in the complex. That’ll keep their mouths shut. So heeeeello California, I’m a lesbian! Just kidding. Things got resolved though later- they’re letting me sign a three-month lease instead of a year so I can actually be a legit tenant and not the lesbian who spends the night all the time. I mean I’m sure Val and I would make a beautiful pair but I think Stu would prefer otherwise. Tomorrow we’ll go through New Mexico and Arizona into SoCal. I’m so excited, I just want to be there!!! Dad doesn’t leave until Wednesday afternoon so I think we’ll do some exploring before he leaves. Kirbie!I’m so excited for you and Cali adventures! Good luck with the rest of your trip there! P.S. I grew up in Kerrville…explains alot about me. How awesome 🙂 i’m excited for you!! !oh and btw.. its Border Patrol, haha I only know that b.c we have them out here!! I live semi- close to El Paso.. about 3 hours East!! !well, keep us posted! !I lovee reading your blogs! Previous PostPrevious We’re going on a "break." Next PostNext I’M IN HOLLYWOOD!! !